One minute it seems our cars heaters are on full blast in the depths of winter, and summer seems so far away, then suddenly we’re sat in our cars sweating—air con pumping out lukewarm air and we would happily go back to that Baltic weather. Cool2U provide some respite from our inconsistent British summers, so for those freak weeks of summer that we thought would never really arrive, we can at least drive in comfort. They provide this service through a mobile air con service which repairs, optimises and cleans car air con systems, they cover most of the South Wales area with their service and as such wanted a highly optimised website that suited this. At guwii, we created the branding and simple 3-page website for Cool2U. Not all sites need to be complicated and groundbreaking—this site is very performant, from the page speed loading aspect through to users being able to access the info they need to get in contact with Cool2U, on average users are able to load the site and contact cool2u within 1 minute! 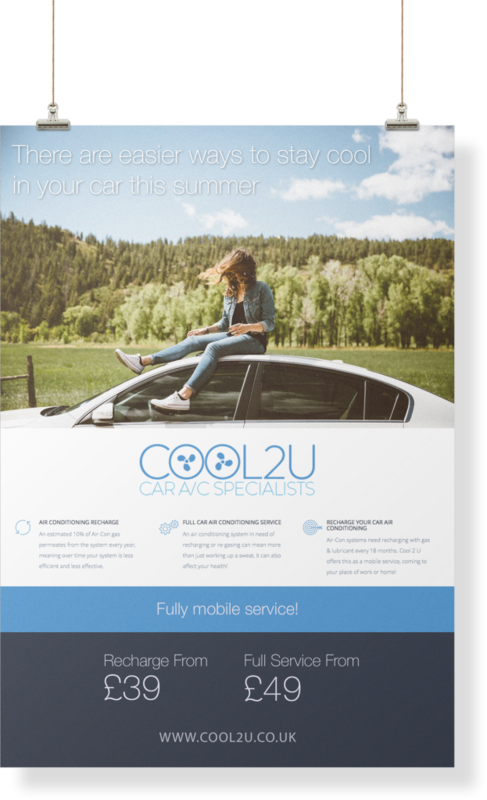 Summer is the busiest period for cool2u and we ran a campaign for them to help promote their services locally, this involved an eye-catching poster design distributed locally, matched with an online social media campaign which helped cool2u achieve record sales. Behind the scenes where we’ve developed the site further to ensure the site is optimised for SEO and with some cool API’s such as Twilio for text messaging alerts and back-office systems. Cool2U now rank top 10 for the keywords surrounding air con repairs and optimisations in Cardiff and the South Wales area.